In the near future, dog fever and snout flu have swept across the city of Megasaki, Japan. In response, the mayor has banned all dogs and expels every last canine to Trash Island. A few months later, a young boy steals a plane to fly to Trash Island to find his exiled mutt. 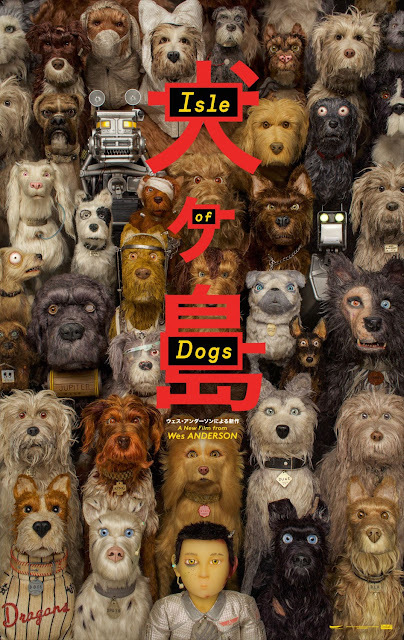 We love dogs, and we almost always enjoy Wes Anderson films, so it makes sense that we would be drawn to his latest film called "Isle of Dogs." It is Anderson's return to the stop-motion animation style that he used so well in "Fantastic Mr. Fox." The story is written by Anderson along with Roman Coppola, Jason Schwartzman, and Kunichi Nomura. The film takes place in the near future in the fictional Japanese city of Megasaki. When an infectious disease strikes Japan's dog population, the authoritarian, cat-loving mayor Kobayashi (Kunichi Nomura) signs an order decreeing that all dogs must be banished to Trash Island. All of the dogs do their best to survive on whatever scraps they can find in the garbage that is shipped to the island. The mayor's ward, a young boy named Atari (Koyu Rankin), steals a small plane and flies it to Trash Island where he goes on a quest to find his evicted pup Spots with the help of many other abandoned hounds including Chief (Bryan Cranston), Rex (Edward Norton), Duke (Jeff Goldblum), King (Bob Balaban), and Boss (Bill Murray). We have to start our review by saying that while this is an animated movie, not all animated films are made for little kids. Be aware that "Isle of Dogs" is rated PG-13 and deals with themes that are probably best tackled by a slightly older audience. That being said, some of the more mature young folks (middle school-aged kids+) will most likely be able to deal with anything this movie has to offer. If your kids have seen "Fantastic Mr. Fox" and were totally fine with it, they should be okay watching this movie. Onward! "Isle of Dogs" is a film that is quirky, humorous, artful, and bizarre. It's quintessential Wes Anderson. His style transfers very easily to animation and stop-motion animation partially because his live-action films are so whimsical in the first place that they feel like live-action cartoons. We personally love this form of filmmaking. As we mentioned, it is very reminiscent of "Fantastic Mr. Fox" with the design of its characters, the way they move, and even how they fight. The texturing of the dogs and the way they move their extremities makes them feel weirdly realistic. 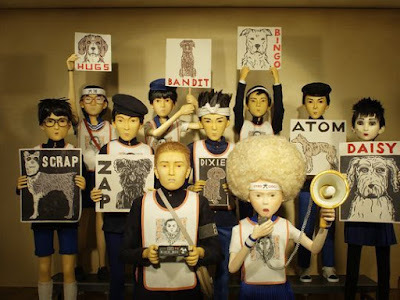 We found ourselves drawn into this story from beginning to end and never once felt bored while watching "Isle of Dogs." 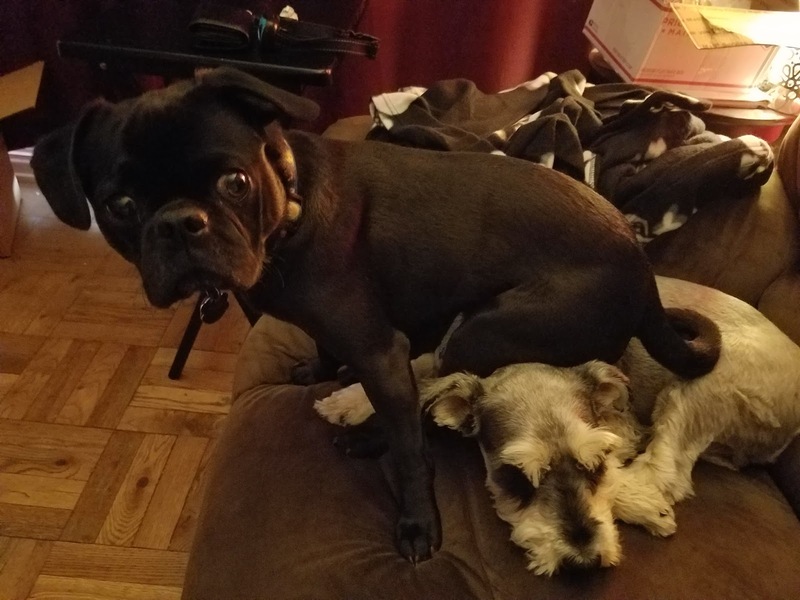 Being pooch lovers ourselves, we can relate to Atari and understand the lengths he is willing to go to find and save his best friend Spots. This film is a joy to look at because it is colorful and blends different animation styles beautifully. It is also unique in the way it handles its dialogue. All human characters speak their native tongue and are only translated intermittently. Unless you speak Japanese or English, you probably won't understand a good portion of the dialogue, but we still get the gist of what is being said through context and body language. The dogs, on the other hand, have had their barks and grumbles translated into English "for our convenience." This is a fun way to let the audience know that the dogs don't actually speak English, so we don't mistakenly think they are anthropomorphic. Finally, "Isle of Dogs" has a lot to say about corporations trying to control the media. Kobayashi has an ulterior motive for banishing all dogs and attempts to control the narrative about the "little pilot" who went in search of his pet. It shows the lengths people in power are willing to go to remain in control and explains how they censor information that they deem detrimental to their message. This makes it especially important when high-schoolers Hiroshi (Nijirô Murakami) and Tracy (Greta Gerwig) make it their mission to gain as much of a following as they can with their pro-dog school newspaper. They hold rallies, make speeches, and put their lives on the line to stand up to Kobayashi and his oppressive regime, directly parallelling many important moments in history (some even more recent than we expected). We really had a great time watching "Isle of Dogs." It has of both laughter and tenderness that made us a little misty thinking about what would happen if we ever lost our own pups.